Middletown Mayor Dan Drew, who’s running for governor, positioned himself as a candidate of the progressive wing of the Democratic Party during a recent visit to Darien. 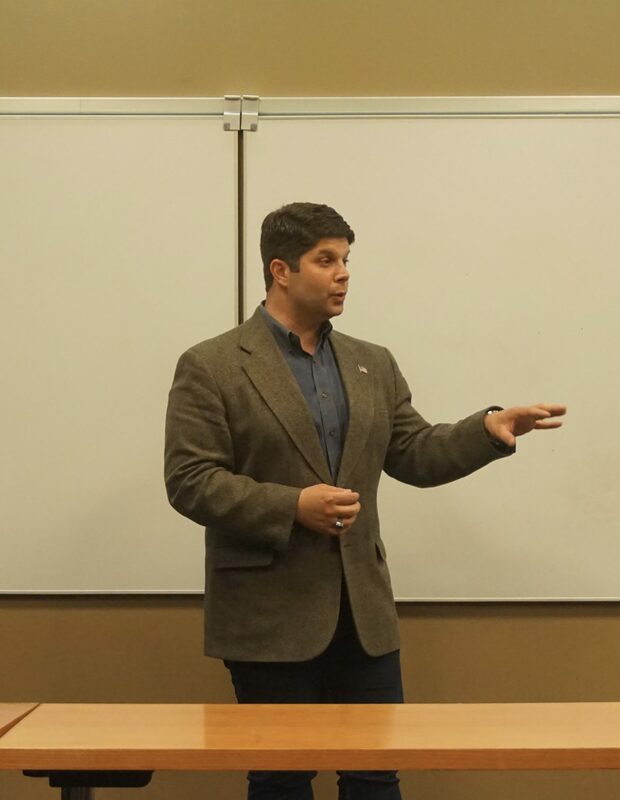 Speaking before the Darien Democratic Town Committee on Thursday, July 13, Drew talked about some of his proposed solutions to the state’s budget woes. Shortfalls in tax revenue, have swollen the state’s potential budget deficit to $1.7 billion. To solve this problem, he recommended legalizing and taxing recreational marijuana, instituting highway tolls, raising the state income tax, and implementing various state and municipal government reforms. Many of his proposals center on a state government focused on stabilizing Connecticut’s middle class. Drew wants a universal single-payer healthcare system in Connecticut. By uncoupling health insurance from employment, people can change jobs and start small businesses without fear of losing employer based health insurance. — Find out more about candidate for governor Dan Drew here. Having healthcare is a personal issue for him. The GOP healthcare plan currently makes organ donation a pre-existing condition, a status that Drew, who donated a kidney to one of his constituents, could gain if the GOP proposal is passed. Drew is also a supporter of free higher education in Connecticut’s state and community colleges. He believes in tailoring higher education to the growth needs of industry. Defense contractor Pratt and Whitney was raised as an example. Drew favors initiatives aimed at educating workers for jobs in demand in Connecticut, and incentivizing businesses to come to Connecticut by easing regulations and red tape. He is also a supporter of the legalization of recreational marijuana and increasing the state’s minimum wage. Drew has been the mayor of Middletown for almost seven years. During that period, city departments were reorganized, and restoration projects changed the waterfront and public parks. To lower healthcare costs for elderly residents, he instituted a prescription drug discount program. He also negotiated FedEx’s purchase of a 264-acre site in Middletown after Aetna left. The construction of the facility is projected to bring over 1,000 jobs to the town. Drew was an emergency medical technician at age 18; after graduating from the University of Connecticut, he became a journalist who broke stories on political corruption. He has also worked at Middletown’s Community Renewal Team, where he developed a welfare-to-work program providing job training to single mothers. Despite Connecticut’s problems, Drew is optimistic about the state’s prospects. Former Selectman David Bayne was elected chairman of the Darien Democratic Town Committee at its meeting last Thursday. Maribeth Sears was elected treasurer, and Elizabeth Hall, secretary. "This is an exciting time to be a Democrat," Bayne said. An 18-year-old woman was charged with possessing marijuana with intent to sell, a felony, after police found she had a hair under four ounces of pot in her vehicle when she got into an accident on Mansfield Avenue. Darien police described the incident and arrest with this account (including accusations not proven in court): Lauren Curcio of Westwood Court in Stamford, was driving her black 2012 Honda Accord south on Mansfield Avenue shortly before 4:30 p.m. on Monday, May 16 when she looked down as her vehicle crossed into the northbound lane near the intersection of Mansfield Avenue and Stephen Mather Road.